During it's years of operation, the Sydney Showground Speedway, Moore Park saw 28 riders and drivers lose their lives ( either immediately or within a short space of time) as a result of accidents while competing at this famous venue. The first fatality was in 1926 and the last in 1973. 15 Solo riders, 4 Sidecar riders, 2 Sidecar passengers and 7 Speedcar drivers lost their lives. On the 10/11/00 a plaque was placed and dedicated on the wall on what was the Start / Finsh straight at the old circuit ( now Fox Studios). This plaque ( sponsored by the four Vintage Speedway associations in NSW ) honoured ALL those riders and drivers who had made the ultimate sacrifice for the love of their sport. Listed below are their names. This list is as complete as our research allows, if there are any omissions they are unintentional. Riders or drivers passing away years after an accident are not included in this roll as the line must be drawn somewhere. All care has been taken in the research of these events, if documented proof can be supplied for any other fatalities ( of riders or drivers ) at the Sydney Showground Speedway (only) consideration will be made to add such documentation to the records. 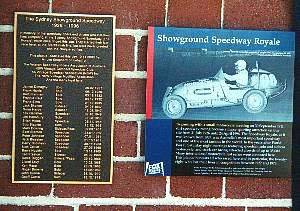 These two plaques were dedicated and mounted on the wall in front of the old Suttor stand on what was the main straight . The bronze plaque on the left lists the competitors names whose lives were lost and the coloured plaque on the right was supplied by Fox Studios to recognise the fact that Speedway had been held in the arena. Although three omissions were made with the plaque ( whose deaths were not known of at the time of compilation) it is intended to honour ALL of the competitors who lost their lives.